A. Volz: How to manage the company with more than 40 years of experience. The story, 5 tips for young people and many useful information about crane market. BKL Baukran Logistik GmbH is specialised in selling and renting cranes, with more than 40 years of experience. 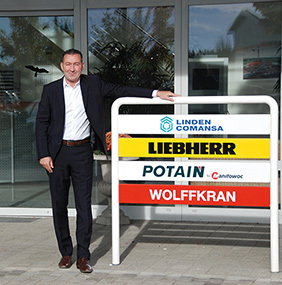 Today, the company combines the best products from top European manufacturers Linden Comansa, Liebherr, Potain, Wolffkran and Cattaneo all under one roof. This time we are going to interview to Mr. Alexander Volz, CEO BKL Baukran Logistik GmbH. studies. Why did you decide to do the career in crane business? How did you join the company? 1980 he initiated the setup of the rental fleet. Of course I have grown up with the crane business. Even as a little boy I was fascinated by the steel giants and the engineering around. It was the logical consequence that I worked in the family business during every school holidays and experienced the different divisions, when I was old enough. Cranesy.com: Do you remember your first earning? A. Volz: My first hourly wage was 8 Deutsche Mark, the usual hourly rate for a student job at this time. Cranesy.com: Which character qualities help to manage the business? A. Volz: For me an important characteristic is technophilia. If I wouldn’t be fascinated by the huge machines and highly interested in the technology of cranes, I’d hardly have enough motivation to develop BKL as one of the market leaders in Germany and maybe Europe. Furthermore, if you want to manage the company with the youngest and most modern crane park, you always have to be up to date about new and promising technologies. Another important characteristic in a changing market is flexibility in any way. Cranesy.com: What kind of differences are there between male and female entrepreneurs? I’d appreciate, if our male-dominated business would have a higher proportion of female entrepreneurs. I can imagine that this could positively influence our business-culture. Cranesy.com: Your actual view of crane market today? register advancing prices in the rental business at full capacity of our crane park. The utilization in the German speaking part of Europe is at a satisfying level, too. But in other European countries, respectively in South Europe, the rental market still continues to languish at lower levels through the economic crisis. Cranesy.com: Should employer keep a distance or in reverse make friend with his staff? even for decades. Needless to say, that sometimes friendships arise. In my opinion it is a good feedback for BKL, but it is important to keep a professional balance between distance and friendship when it comes to business. I think that works very well within the BKL team. Cranesy.com: 5 tips for young people who want to start the business in crane sector? A. Volz: First of all, technophilia is an important characte ristic quality. I’d also recommend to gain as much practical experience as possible (related to the practical side of the business – i.e. all around construction sites, electronic requirements, pr oject work etc. etc.). Young profes sionals in the crane business should continuously develop their knowledge of the market, the technology and products. Last but not least: young people should always keep their innovative thinking, because successful people should be game enough to break the mold. Cranesy.com: Aside a work how do you spend your free time? Cranesy.com: Your favourite citation or motto to have success in working and personal life? A. Volz: Always 150 percent performance – this holds good for the BKL product and service portfolio: crane park, customer service and consulting. And of course to pay the same level of attention to the family.